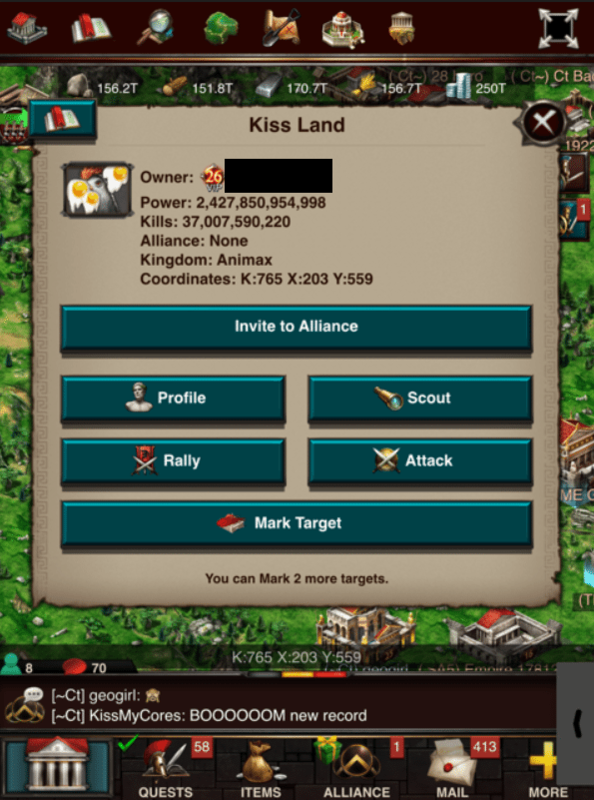 KissMyCores from ~Ct, has broken the heroless record. 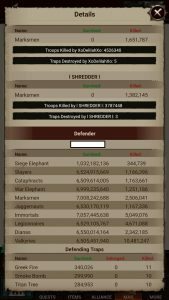 SH had 61B troops when he was hit. Rally was lead with 11M march, Black Friday Aura boosted to L5, and a potion. Hero in prison lead to 30M troops killed. Also notable, with the same set of cores KissMyCores burned a 211B, in Sola. 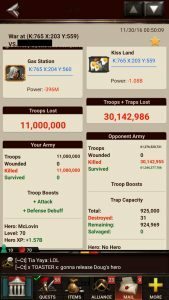 Wolfstein77 had 8.2B troops when he was hit, and he lost 11M in the rally. Records are being broken faster now, with new cores, potions, and huge rally sizes. The last one we posted, was just 6 days ago, and this SH was almost 1T bigger than the previous record! I mentioned last week that people needed to start checking their set-ups. If you haven’t already, now is the time! Since it was a test, the defender has asked to please hide the names from the reports. We appreciate members constantly letting members test the limits of new releases. Nice. I was testing this with another one of my alliance members earlier today while I was burning a +6 BF Perses. 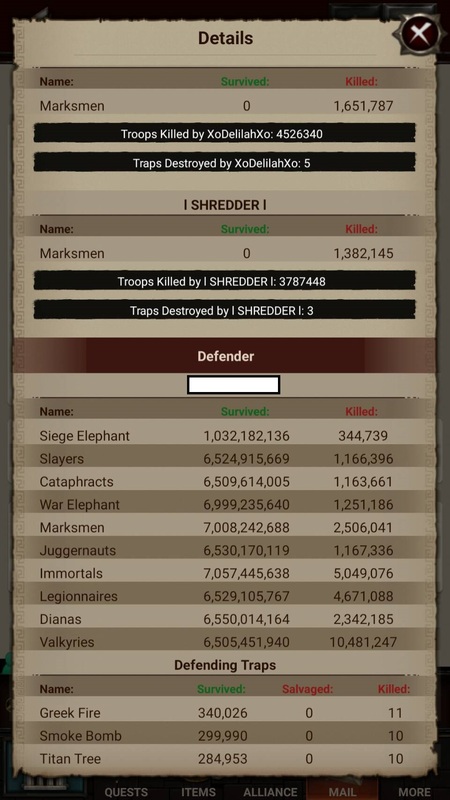 He was 500b, roughly 95b research and ~10b t4 troops, and I hit him for close to 40m kills with hero out. I also solo burned him with hero home in exalted general and oracle (with extra skilling in defense) for 20-25m kills each. I’ve been trying to figure out what the new limit is for a successful burn on hero out/ bad gear….helpful information you have here ? Yeah I watched that Wolfstein77 zeroing. 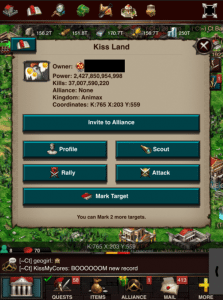 But I didn’t catch it until it was already 179B with multiple alliances hitting him. Paladin of Sola powered up 10 got zeroed down to 53B. 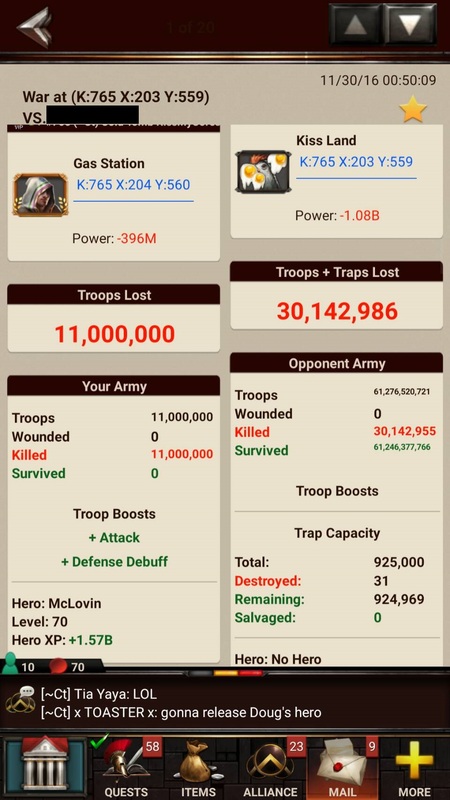 Records being broken like crazy now with stronghold 26 out + potions, just the other day a 2 trillion with hero home ( in bad gear with 62b troops ) burned. Just shows how much has changed in one month.